When Lee was young, his kid brother loved peanut butter and jelly sandwiches. One day after baseball practice he joked that he was so hungry he could eat a hundred of them. 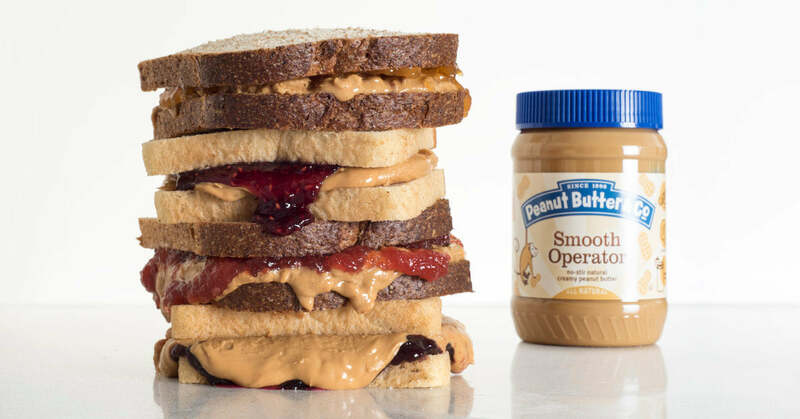 They didn’t have enough bread in the house for that, but Lee made him this double-decker PB&J, which kept him full until dinner. 1. Toast the bread and immediately spread 2 tbsp of peanut butter on one slice of bread. Spread 1 tbsp jelly on the second slice of bread and close the sandwich. 2. 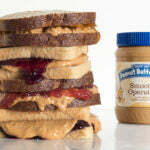 Gently spread the remaining peanut butter on the top of the sandwich—hold the edges of the top slice to keep it steady. Spread the remaining jelly on the last slice of bread and set it atop the sandwich, jelly side down. 3. Insert two toothpicks, each about 2 inches from opposite corners of the double-decker sandwich, and slice in half diagonally. The post Peanut Butter & Co. Sandwich Shop: PB&J Club appeared first on - Peanut Butter & Co. Recipe Blog.